It is 2235 and I am committing my first words on today’s blog. It will be some combination of a late night / early morning. Doug visited the Oban Distillery yesterday and has tucked me off with a glass of their 20 year old to help me write. But, where to start? It has been a long short day; an extraordinary contrast in every respect to yesterday’s perfect day; but with an evening which is emblematic of Life Cycle experiences, though in truth I do not know where to start on that. Ardnamurchan Point is the most westerly point of mainland GB. Our route there was via Mull. 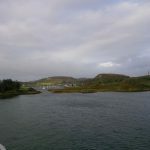 It started with an early ferry from Oban to Craignure. That meant breakfast before our hotel provided it, so our Support Team did that job. The start of a very long day for them. Oban was overcast and cold, which set the scene for the day. We did have a problem at the ferry terminal, because we did not have the right kind of ties for the truck. So, either pay £170 for a set, or find an overland route. Ian and Gary opted for the latter, and that bit of misfortune delivered some seriously good fortune later in the day. The crossing was pretty smooth, with some great views, despite the weather. 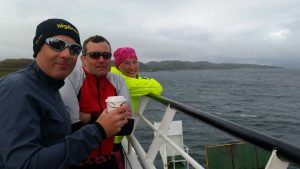 From Craignure we knew we had 22 miles to Tobermory, and the received wisdom was that would be ‘pretty flat’. Not only was it far from flat, between leaving Oban and arriving on Mull, the winds had really gained strength. When we were facing headwinds and rain, it was just hard; when they became crosswinds on fast descents it became scary, as rider and bike wobbled on the road. 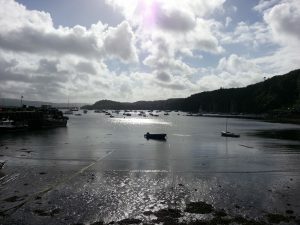 Tobermory is a Hebridean gem. We had enough time there to enjoy the town, the views and have lunch before crossing back to the mainland to the Ardnamurchan Peninsula. 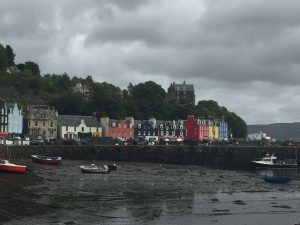 The Tobermory – Kilchoan ferry was smaller than our earlier craft and exposed to the full force of westerlies coming straight off the Atlantic. The swells topped out at about two metres, so we rolled around a fair bit. We were pleased to be on the boat for just 30 mins rather than a couple of hours. Gary and Ian were waiting for us at Kilchoan. Having come overland, they had already travelled to Ardnamurchan Point and back. Their clear advice was we should not ride, based on the quality of the road surface, the fact it was single track, and the wind strengths on a very exposed area. They had made the risk assessment, we accepted their advice and went to the Point in the van. 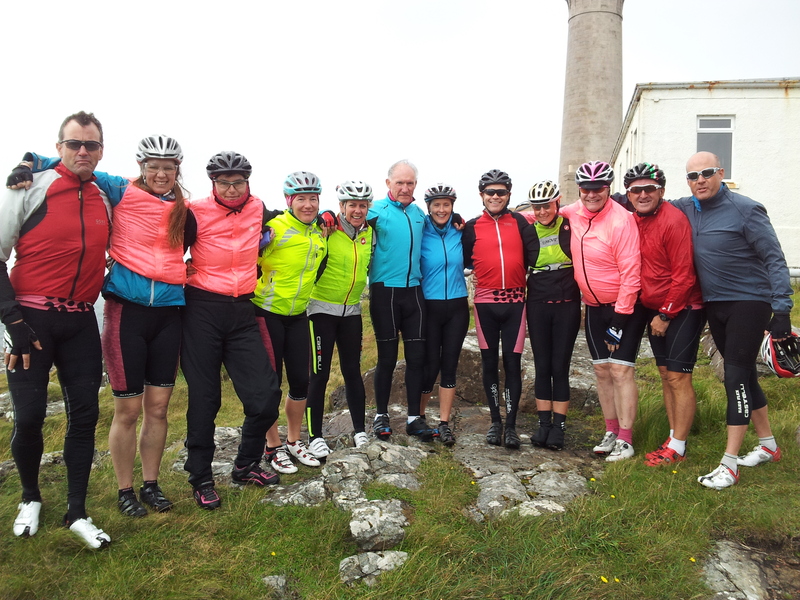 Any disappointment riders felt at not actually cycling there was quickly dissipated by a first-hand view of the road surface, and completely evaporated when they arrived at the lighthouse and felt the wind strength. It was just unsafe. I find it hard to estimate these things, but would have put it at 30 – 40 mph. it is a bleak windswept environment, but with a raw beauty. It is not quite the wilderness of Cape Wrath, but it comes close. So, we did not arrive at our third point of the compass quite as planned, but we got there together and safe. From Ardnamurchan we had 28 miles to Strontian, initially climbing over the west end of the peninsula, then weaving up and down the north shore of Loch Sunart. It was brutally hard work. On the high ground the views were spectacular, but most of the time we were in heavily wooded terrain, and with periodic drenchings. The total miles cycled today was only 51. Yet because of ferry crossings, down time, and tough terrain, we left our hotel in Oban at 0715, and Stefano and I were last in at Strontian at 1830. Moreover, in those 51 miles there was 3,600 feet of climbing. We are at the stage of this challenge where fatigue is visibly setting in. I am exhausted. The combination of 1,100 miles in the saddle and short nights day after day has caught up with me, and I am not alone; we had quite a few sleepers on the ferries. Our bikes are also showing the strain, they have taken a real hammering. Nick has spoke problems, John has gear problems, as do I. Today my chain jumped off the cog and jammed completely whilst going up a steep incline. I was immediately stationary and there was only one way I was going. I made sure I fell to the right rather than on my left hip. We stayed at the Ben View Hotel, owned, managed and operated entirely by Graham. He ran the bar (although that became a job Nick took over). He cooked a three course dinner; he served that dinner; and he did our laundry. He will be clearing up after dinner and will be preparing and serving breakfast. At least he does not have to run a bar in the morning. Inevitably a dinner planned for 2000 started nearer 2100. But when it came, the food was expertly cooked, presented and served with a running commentary from Graham. It was extraordinary. No one complained. Karen’s playlists came out for ‘name that song’; Stefano inevitably had a boom box with him, and a sing song began. It was bonkers. As the saying goes ‘you had to be there’. Fortunately it is remote and we had no near neighbours. But it proved yet again what a wonderful analgesic laughter is, and what a wonderful bunch of people I am with. It is fair to say that the Ben View is a work in progress, but Graham really does deserve to succeed, and I hope he does. Our Life Cycle miles today were in honour of Sarb Atwal (nominated by Susan); Stefano’s Aunt Mary (nominated by him); Phil Stannard (nominated by Sue Stannard); and Rita Lewis (nominated by Paul Barrett). Your stories inspire us to push on. Finally, I want to pay tribute to our Support Team. Simon, Paul, Gary and Ian have long days every day. Today was an especially tricky one for them. But they are so resourceful and creative, nothing whatsoever phases them. They are remarkable people. We are at 1,096 miles. Tomorrow we have 90+ miles to Beauly, and the weather forecast is grim! Sorry that the labours of Day 13 followed so hard on the heels of a beautifully accomplished Day 12, but glad that you made it to the compass point safe and together. Whichever way you cut it, it sounds tough. Am glad you managed to salvage a jovial, musical evening at the end of such a long day, perhaps piloting the idea of a LifeCycle 6 CD to keep the funds rolling in… I offer the following synonyms for today; stout-heartedness, mettle, resilience and spirit. Congratulations to the whole team, supporters and riders, for displaying them all with such flair at this gruelling stage of your journey. I hope that the weather for day 14 is not as bad as you might have feared. OUCH you have all my sympathy for the scrapes and strains, the wind and the rain. We are looking forward to seeing everyone back, safe and sound, on Sunday. Well done on compass point three gang I think you can be forgiven in the circumstances for not arriving on bike. All you have to do is 75 laps of the boating lake on Sunday to make it up, I know that’s a longer distance but it’s much easier terrain!! Congratulations to the whole team on reaching the 3rd compass point, and getting through what sounds a truly grueling day in such high spirits. Keep supporting each other and pushing through the fatigue. The end is in sight! What you’ve achieved so far is absolutely incredible. P.S The officers would love a copy of Karen’s playlist on your return! It sounds as if you have all had a really tough day I’m not surprised you are exhausted! I love the photo at the lighthouse. When Andy Noyes finishes as HoS he could get a job as a bouncer. I hope today’s 90 plus miles wan’t too punishing. Not long to go now and then you are done. Well done on CP3 everyone. Nearly there, this time next week you’ll all be wishing you could be back on your bike! “Cycling isn’t a game, it’s a sport. Tough, hard and unpitying, and it requires great sacrifices. One plays football, or tennis, or hockey. One doesn’t play cycling,” though I don’t suppose you need to be told that! Sounds like one hell of a day, but great to hear that everyone seems to be in great spirits! Not far to go now and when you get there is will be a formidable acheivement! Keep going – you are all amazing! 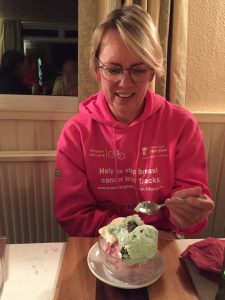 I read your blog every day and am filled with pride that you are all doing so much for this great cause. It also triggers memories of my childhood as you describe the terrain, particularly around Dunoon, Oban and Mull, where I spent so much time. Your description and photos made me homesick! Cycling is not as easy as people think, particularly in wind and rain and the state of some of the roads up there, and to ride day after day to cover all those miles – no matter what – is amazing. I wish you a safe onward journey and I am sure you will make good use of the physio and bike mechanic! !